2. Select Dashboard from the expanded left menu. The dashboard gives you real time reporting. All numbers are up to date to the time you accessed the page. 3. The dashboard will default to the Transaction Status tab. This tab provides an overview of the total number of transactions (Paid, Unpaid, Cancelled and Refunds) in your database for the dates displayed at the top of the screen. 4. Click the Payment Analysis tab. The analysis tab will show you how many payments have been made to your organisation for the current day (today), each day for the current month and then an aggregated count for previous months. 5. 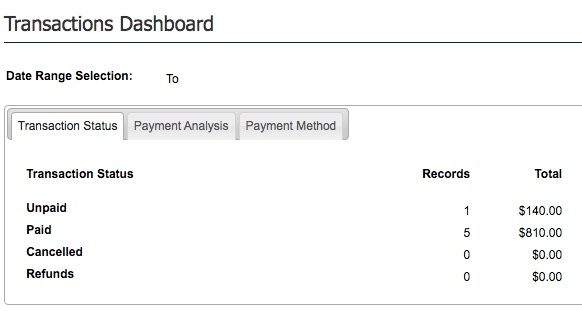 The Payment Method tab will show the breakdown of transactions by the method of payment noted in the system. For example, Online, Cash, Cheque, etc.